By way of introduction, we are Stan and Val Creighton, owners of FPB 64-7 (Buffalo Nickel) and owners-to-be of FPB 70-1. From time to time we’ll be sharing our personal reactions and some backstory, as Steve Dashew’s remarkable new design assumes physical form as a cruising yacht. 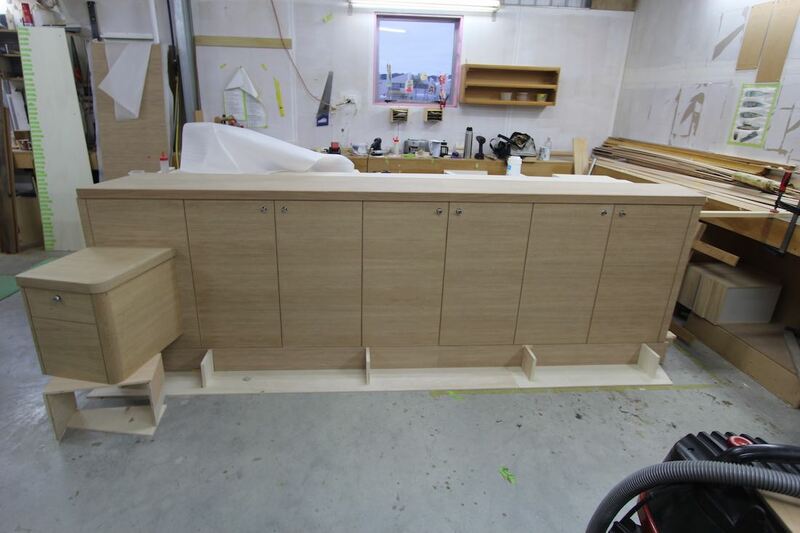 Every so often, we receive photos via e-mail documenting construction progress on our boat. As expectant parents of this first FPB 70, we pore over these pics in much the same way as we would ultrasound images of our unborn baby. It’s a rare thrill to be able to watch the process unfold all the way from our distant vantage point in Seattle. In the above image of three FPB hulls, ours being the one in the center, the first thing we noticed was that our baby now has a head! Her house top is on. As we had hoped and expected, her lines and overall profile look to us like a sleeker version of our FPB 64. Her big sister 78-3 on the right is, naturally, taller in comparison. The photo below shows 70-1 from aft, looking forward. 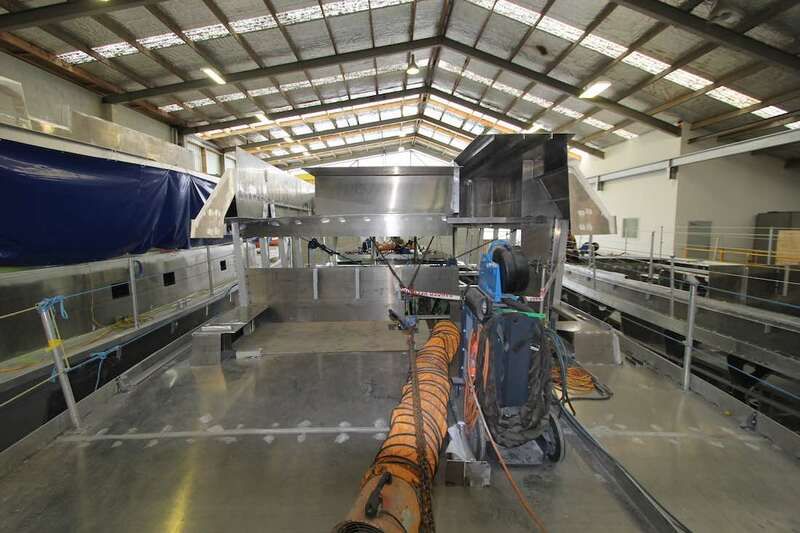 And the skeleton of 70-2 can be seen on the left side above, awaiting its aluminum skin. We have engaged an expert marine surveyor for local oversight on certain aspects of the construction. Whether in photographs or in person, to us the various welded spots and seams look like a meaningless bunch of dots and dashes. But at appropriate times our engineer has been performing dye penetration testing and X-rays to assess hull and tank integrity. 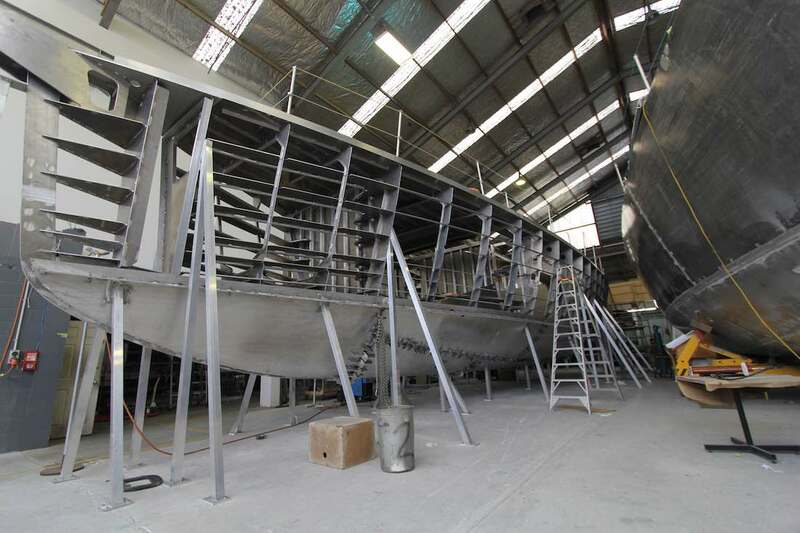 The results have been validating the high degree of confidence we have in Circa Marine’s skill as boat builders. 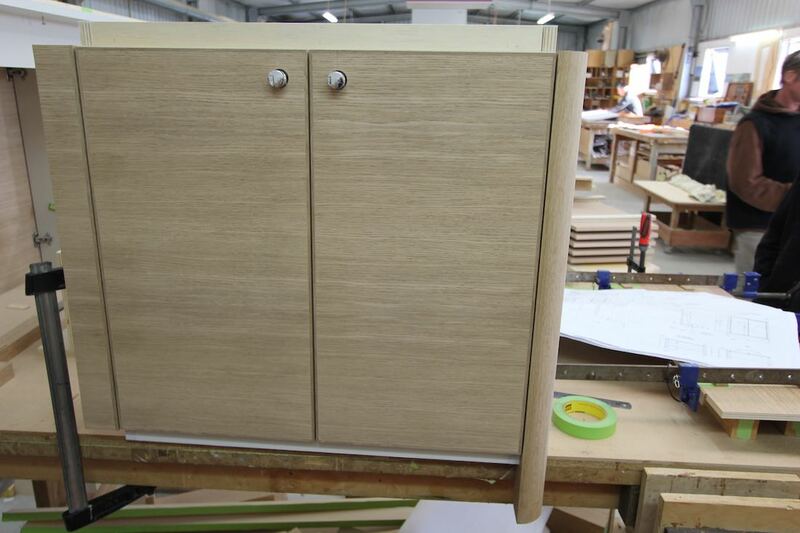 Circa’s ‘chippies,’ as they call their cabinetmakers – I think it’s a Kiwi thing? – have been busy with our interior furnishings. 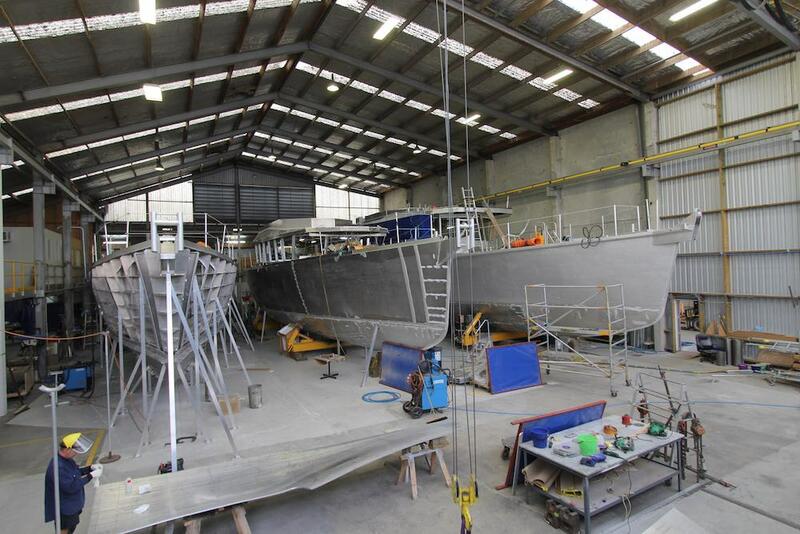 Commissioning the first hull in the 70 series put us in a unique position in terms of having a small bit of input into the interior design of the boat. In order to maximize this opportunity, we have been working with an interior designer of yachts here in Seattle, Sylvia Bolton. It was her suggestion that we request that the wood grain be oriented horizontally. We think it lends a sleek, expansive visual impression in the relatively small spaces aboard a boat. This entry was posted on Friday, May 26th, 2017 at 1:25 pm and is filed under Dashew Logs, FPB 70, The Logs. Both comments and pings are currently closed. Thank you Stan and Val for letting us “tag along” on your adventure. Great stuff and thank you for sharing! Are you willing to describe your basic design and layout ideas, number of staterooms etc.? There is lots of pertinent detail on the FPB 70 intro page on the site. Stay tuned for a newly updated page in the next week or so, with new detailed renderings. Thank you Sarah, I’ve already chewed through that pile:) It’s just about time I bought my own boat. Of all the FPBs I am thinking this is my favourite. Nice lines, and the layout seems to address all the questions I had with the other FPBs, though I would be happy with any of them! I was wondering what the 6′ difference was.. I sort of get where the difference of the 64 to 78 Lay.. But the 70’s are an intriguing concept..
IS there a working formula that you can give to demonstrate the balance[center of Balance] to tip ratio.. ie 10t Below to “X”t’s above a CoB.. because I wonder what the weight increase would need to be to help with extra solar panels on the roof of the matrix deck of the 78’s.. I understand that the size and actions of the 2 stabilizer fins come into Play..
ie if I added 6 extra solar Panel assuming that they add 6 x 35kg to the top weight what would you need to add to the bottom..
-Re Flexible[Thin line] solar Panels I don’t think the technology is at the same stage as the normal[typical design] the weight saving don’t seem to be there to both the weight to Power Produced ratio and the Cost Per Watt Ratio.. current technology put the normal Solar Panels at a A$1 – A$1.25 Per Watt Ratio when compared.. Plus there are some other factor that limit the usage of the Thin solar Panels.. ie heat dissipation..